A DARK, burdensome day. I stormed up from sleep this morning, not knowing what to do first. . . . I fell back into bed and spent an hour or so collecting myself . . . . Then I rose. There were low clouds; the windows streamed. The surrounding roofs--green, raw red blackened brass--shone like potlids in a darkened kitchen. In its description of a world so remote and alien from our own, this and other passages from Dangling Man are like something from science fiction, something that no longer exists, drawn from what is for us a fantasy approaching that of Coruscant in its galaxy far, far away, or an urbanized Mars of the future as in Total Recall. The events in Dangling Man take place between December 1942 and April (the cruelest month) 1943. Joseph's entry quoted above, then, is for January 13, 1943. 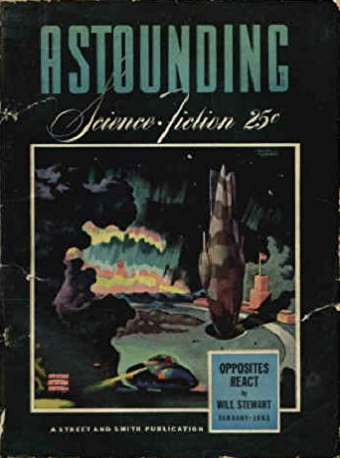 The magazines that Bellow's diarist might have seen on that newsstand under the El would probably have been dated February or March, but for the snapshot below of a month in the history of science fiction, fantasy, and horror pulps, I'll choose the month of January 1943. As you can see, a couple show the imagery of war. The rest might easily have come from a time of peace. War looms over Dangling Man as it does over the January 1943 issue and cover of Weird Tales. Art by A.R. Tilburne. 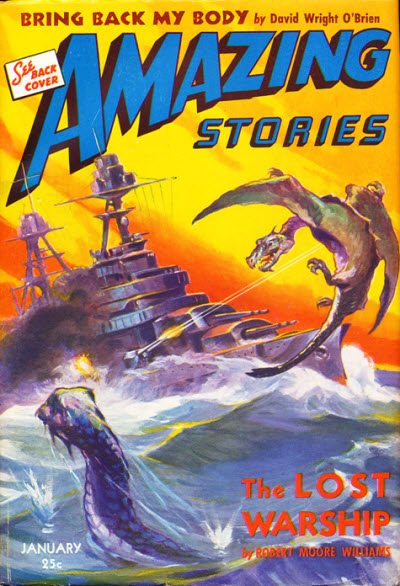 War, too, on the cover of Amazing Stories. Art by J. Allen St. John. Art by Robert Gibson Jones. Today's entry is eccentric. In its spinning and turning, it will catch a renowned artist, poet, and critic; a pop singer who cast herself as a witch; an actress who played a princess; two worldwide pop-cultural phenomena; a song about dreams; and the dreams themselves of countless young people--dreams of quest and conflict and a chance at becoming a hero in a battle that never ends. Among those who dream and who have dreamed were four boys who, on a day forty years ago, sat in a darkened theater in Indianapolis, eagerly awaiting the start of a movie that would prove unlike any before it, even if it was drawn from tales as old as storytelling. My older brother had seen the movie before. My younger brother, his friend Tom, and I had not, but we were excited in a way that only children can be excited to see a movie about which we had heard so much. Not long before that day at the Eastwood--a theater now laid low by the passage of time--the movie had opened across the country and had almost instantly become a sensation beyond any moviegoing experience before it. Nothing before and nothing after--not even Jaws from two summers before--would match what it became in the year and more following its release. It has since grown into a franchise, moreover, a worldwide phenomenon. The movie was of course Star Wars. It came out forty years ago today, on May 25, 1977. Strange details stick in your head. I remember that as we waited to see Star Wars, a song played in the theater. (Those were the days before commercials were shown before the movie begins.) The song was "Dreams," by Fleetwood Mac, from the album Rumours. I didn't know it at the time, but Rumours was released on February 4, 1977, not long before Star Wars came out. It was a sensation, too, and became one of the biggest-selling albums of all time. "Dreams" reached number one on the pop-music charts on June 18, 1977, probably around the time the four of us went to see Star Wars. (Our seeing it was an early birthday present from my parents to my younger brother.) Another thing I probably didn't know at the time: "Dreams" was sung by Stevie Nicks. Now comes the strange part--strange, then somewhat plausible, at least in my view. The heroine of Star Wars was of course Princess Leia, played by Carrie Fisher, who was only nineteen years old when filming began on Star Wars in March 1976--nineteen and completely convincing not only as a princess but also as an interstellar senator. Although she had been in movies before, Carrie Fisher became a household name with Star Wars. Millions mourned her death this past year. She was loved as few people in popular culture are truly loved. Stevie Nicks is also loved that way, by millions the world over. She who sang "Dreams" for us has, strangely enough, been named as a possible replacement for Carrie Fisher. This isn't just some lone fanboy's dream: it's actually a thing on the Internet. As soon as I heard about it, I thought That might actually work. 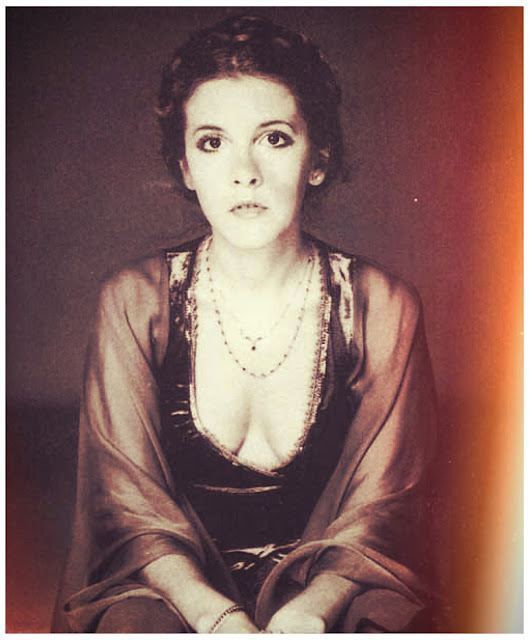 Whereas some people seem to be saying that Stevie Nicks should just be a stand-in or a body double for Carrie Fisher, I think she could actually be Princess Leia. No one I can think of could fill the role, but Stevie is loved like Carrie was loved, and she has a similar stature, not just physically but also in pop-cultural terms. The pop culture of the 1970s is falling into pieces with age as all things do--sadly, neither Linda Ronstadt nor Steve Perry can sing anymore--but if you want to hold it up for at least a little longer, I say Why not? If she can act and if the deal can be swung, why shouldn't we have someone new in Stevie Nicks to play the forty-year-old part of Princess Leia? I realize that it's only a fantasy--a dream--to think that way, but what else is all of this but a dream and a fantasy? So what does any of this have to do with Indiana and its artists? Well, as any Star Wars fan ought to know, Ralph McQuarrie (1929-2012), the conceptual artist behind the film and the franchise, was born in Gary, Indiana. He worked with director and screenwriter George Lucas as early as the spring of 1975, two years before the movie was released. He would go on to work on other films in the series. I would like to go beyond Ralph McQuarrie, though, and write about another Indiana artist who had nothing (or almost nothing) to do with Star Wars but by the turns of an eccentric idea can be caught in a discussion of the movie and its related phenomena. A painting by Indiana illustrator Ralph McQuarrie for The Empire Strikes Back (1980). Kenneth Rexroth was born on December 22, 1905, in South Bend, Indiana. A home-schooled prodigy, then a teenaged orphan, he moved to Chicago to live with his aunt around 1919 or so. Although he is now known as a poet and critic, Rexroth studied at the Art Institute of Chicago in his youth. I would be surprised to find that any of his artwork survives. On the other hand, maybe there are drawings by Kenneth Rexroth hiding among his papers, wherever they might be housed. Rexroth had a varied career as a traveler, friend, husband, lover, critic, essayist, poet, author, translator, activist, and associate of many famous people, including Beat Poets and other literary figures in San Francisco. You can read about him on the Internet and in those ancient artifacts known as "books." I'll note only that Kenneth Rexroth died in Santa Barbara, California, on June 6, 1982, at age seventy-six. 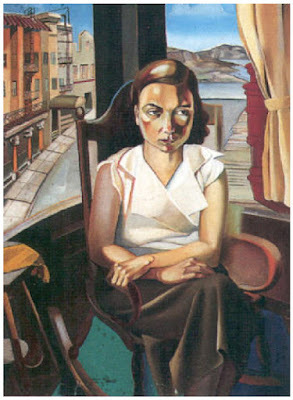 "Dorothy," a portrait by Andrée Dutcher (1902-1940), first wife of Kenneth Rexroth. Now comes a part about which I'm not sure, followed by some thoughts that I hope will stand on their own, even if I'm wrong about this connection to Kenneth Rexroth. And here is that connection, if it really is a connection: a long time ago, I read that there are only two kinds of stories, namely, the Iliad and the Odyssey. I think the quote was attributed to Kenneth Rexroth, but I can't be sure. As happens too often, when you lose a quote, it's hard to find again, even in this age of the Internet. But I have kept that thought in my head and have applied it to the analysis of books and movies over the years. It seems to hold up pretty well. Boiled down even further, the idea is that every story is either of a conflict--the Iliad--or of a quest or journey--the Odyssey. I would like to look into that idea in relation to two high-powered, pop-cultural franchises. 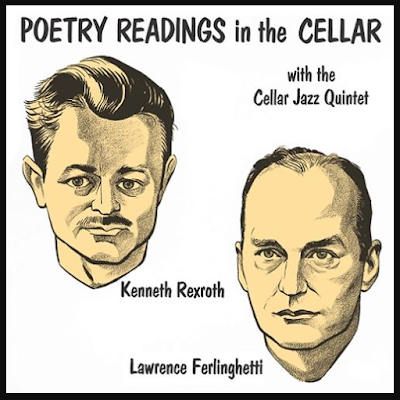 The cover (altered, I believe) of Poetry Readings in the Cellar (Fantasy, 1958), a spoken-word record with Kenneth Rexroth and Lawrence Ferlinghetti. I wrote that there is no connection between Rexroth and Star Wars. Well, that's if you stop too soon. If you don't stop too soon, you'll learn that Lawrence Ferlinghetti (b. 1919) was friends with Erik Bauersfeld (1922-2016), voice of Admiral Ackbar and Bib Fortuna in the Star Wars movies. So just by their titles, these two franchises bear out the idea I have attributed here to Kenneth Rexroth. If there are only two kinds of stories, each must cover a lot of ground. The possibilities for storytelling would seem vast. However, there are limits in each. War eventually ceases. The journey finally reaches its end. Wars and journeys without end can only mean misery and despair. So what does that mean for a pop-cultural franchise? I saw part of the results in Star Wars: The Force Awakens (2015). The moviemakers seem to have been recreating Star Wars for a new generation. That's fine. Star Wars is after all a story for children. Why shouldn't children now have the same chance we had--we four and millions more like us--in 1977 for an exciting fantasy of rushing from one star system to another towards a climactic battle against an evil empire? But there's a crack in the Star Wars story. I say it as a fan, but there's a crack, for in Star Wars, there must always be an Empire and there must always be a Rebellion. The Empire can never at last be defeated, and the Rebellion must always be the underdog, even when it attains power. The Star Wars universe is vast and the possibilities for storytelling are theoretically endless, but the main action in every movie is the same: Imperial forces against Rebels, Sith against Jedi, the Dark Side against the Force. Without that conflict, Star Wars may well amount to nothing. So the war goes on, movie after movie, decade after decade, all with variations on a simple theme: the Empire or its equivalent always builds a big, impenetrable fortress and the Rebels or their equivalents always penetrate it and destroy it, often with what is seemingly the most powerful weapon in the universe, the X-wing fighter. Maybe Star Wars: The Force Awakens recapitulated the original trilogy not so much for a new generation of moviegoers but because it's the only story that can be told in the Star Wars universe. An entire universe and only one story to tell. And maybe Darth Vader returned in Rogue One: A Star Wars Story (2016) because of a further limitation: maybe only he makes a truly compelling villain and a suitable embodiment of the spirit of the Empire. One thing is for sure: he beats the heck out of his weak little tantrum-throwing emo grandson. In Star Trek, on the other hand, there are always new horizons of outer space where no man has gone before. Storytelling in the Star Trek universe is far less limited than in the Star Wars universe if only because it isn't framed and delineated by war, which has, significantly, a classic narrative structure. There is always a Federation and the starships of the Federation, but beyond that, only the writer's imagination places bounds upon what stories might be told. Star Trek, as Kenneth Rexroth wrote of the Odyssey, "is a collection of adventures, of little melodramas." There are limitations even here, though. One is that in the Star Trek universe, there isn't the classic narrative structure as in a story of war. The story just goes on and on, with all parts being equal to all other parts. There isn't any growth or development in the characters. They simply live out their lives in stasis, returned at the beginning of each episode to where they were at the beginning of the last episode, despite anything that might have happened in between. Captain Kirk might have great adventures, but he doesn't grow. Luke Skywalker, on the other hand, might grow (in addition to being a story of conflict, Star Wars can be considered a Bildungsroman), but he can never have peace in a universe that must always be at war. Maybe that explains his retreat to a monastery on top of a rocky island off the coast of Ireland where he will forever look at Rey and she will forever hold out to him his lightsaber. At least it seemed like forever at the movie theater. So which limitation is worse? I can't say. A better way might be to look at possibilities rather than limitations. Star Wars and Star Trek have both told great stories. When they have not told great stories, it hasn't been because of the limitations of their respective types. And I would say that neither franchise has reached the bounds of possibility. There are still more stories to tell, and it's nice to think that forty years from now there will still be excited children waiting in the dark, waiting for the words Space: the final frontier . . . or A long time ago in a galaxy far, far away . . . Happy 60th Wedding Anniversary to My Parents! It becomes more and more plain to me that genre fiction in America is descended mostly from conservative writers--not conservative in the contemporary political sense, but in an older, non-political or even anti-political sense. One exception among the various genres might be science fiction, which tends to be, in its purest or original forms, progressive, forward-looking, and optimistic. But then you could make a case that Edgar Allan Poe (1809-1849) was a founder of science fiction in America (maybe the founder), and Poe was no liberal or progressive. The impieties of "Progress" . . .
(2) That quatrain is the poem "Greek Architecture" in its entirety. Some of ye deem it. Yet I'll on. Sure to explode. 'Twill come, 'twill come! How of a hundred thousand such? Unchristianized? Yea, but 'twill come!" "Your Thirty Years (of) War." Ever, at last, to quiet." In the Dark Ages of Democracy." I have written before--or maybe I have just passed on the observation--that conservatives, though their eyes be directed on the past, are far better at predictions and prognostications than are liberals with their "illusions about progress and human nature." (See what happens when you read classic literature? You start using the subjunctive mood.) Look what Melville foresaw and look what we have now as night falls on the Dark Ages of Democracy: A fast-breeding state . . . a hundred thousand demagogues leading rival sharp communities . . . a civic barbarism of men, myriads of them playing their pygmy parts, all existing at a dead level of rank commonplace . . . unchristianized, disennobled, brutalized by popular science, atheized, debased into equality, yet each knowing all the self need know in self's base little fallacy. And though we don't yet have war, there are at least rumors of war among us. And all of it new confirmation of the fall of Adam, as if we needed any further evidence that we are indeed fallen. I have written before, too, about these two alternatives, anarchy (or chaos, or, alternatively, apocalypse) and despotism (or tyranny, or, alternatively, dystopia). In drawing further distinctions, I think you could say that anarchy and despotism are real-world conditions, while apocalypse and dystopia are more nearly fantasies. And because they are fantasies of the future, apocalypse and dystopia can be considered science fiction, and it is within that genre that stories of this kind ordinarily reside. It occurs to me now that both apocalypse and dystopia are outgrowths of a Christian worldview. Apocalypse is of course another name for the biblical Book of Revelation, which describes, by some interpretations, Christian end times. That's easy enough. Dystopia is a little tougher, but once you realize that Utopia is Dystopia, and that Utopia is simply either a Heaven or a Garden of Eden on Earth (both are called Paradise), then you can see that Dystopia is just another variation on what seems to me a Christian notion that time is an arrow rather than a circle and that it is flying fast and straight, inexorably towards the Millennium. In other words, history is a chronicle of progress, with the benighted pre-Christian era in the past and a glorious Millennial future awaiting us. Science fiction may be an outgrowth of a secular age of reason, but would it have been possible without the Christian concept of progress and of a looking forward to a glorious (and earthly) future? The hope of a profound peace was one of the chief motives in the liberal movement. The traditional order, which was pregnant with all sorts of wars, civil, foreign, religious, and domestic, was to be relaxed precisely for the sake of peace. . . . When we have conceded everything that anybody clamors for, everyone will be satisfied. . . . Swimming in the holiday pond of a universal tolerance, we may confidently call our souls our own. . . . So, all grievances being righted and everyone quite free, we hoped in the nineteenth century to remain for ever in unchallengeable enjoyment of our private property, our private religions, and our private morals. But there was a canker in this rose. The dearest friend and ally of the liberal was the reformer; perhaps even in his own inmost self was a prepotent Will, not by any means content with being let alone, but aspiring to dominate everything. Why were all those traditional constraints so irksome? Why were all those old ideas so ridiculous? Because I had a Will of my own to satisfy and an opinion of my own to proclaim. Relaxing the order of society, so as to allow me to live, is by no means enough, if the old absurdities and the old institutions continue to flourish. . . . No pond is large enough for this celestial swan . . . no scurry into backwaters will save the ducks and geese from annihilation. How should I live safe or happy in the midst of such creatures? . . . [Hence] the price of peace, as men are actually constituted, is the suppression of almost all liberties. The history of liberalism, now virtually closed, illustrates this paradox. Again, a conservative writer and thinker foresaw the future, the future in which we now live, and one in which the liberal reformer, possessed of a "prepotent will," seeks not only to live free from traditional constraints but also to destroy traditional order and traditional institutions because he finds their continued existence so intolerable. There is peace in Dystopia and no freedom. If Santayana was wrong about anything in the quote above, it may be that the history of liberalism is not yet closed. We see that every day, every time one among Melville's myriads playing his pygmy part throws a rock through the window of a person whose rights or property he covets . . . shoots pepper spray into the eyes of the woman who opposes his ideas . . . sets fire to a car or building at a protest against violence and hatred . . . silences by force the speaker with whom he disagrees . . . requires someone to labor for him under threat of legal penalty . . . revolts at any perceived contraction of the power of the State . . . and on and on. I suspect that the history of liberalism may never be closed, as liberalism as a state of mind is just one more bit of confirmation of the fall of Adam. If we exist in a fallen state, then we will continue to aspire to godhood and to order the universe in accordance with our own dark whims and desires. There will always be within each of us a skilled destroyer and a ruthless tyrant. So that brings me back to Poe as a founder of genres of fiction. 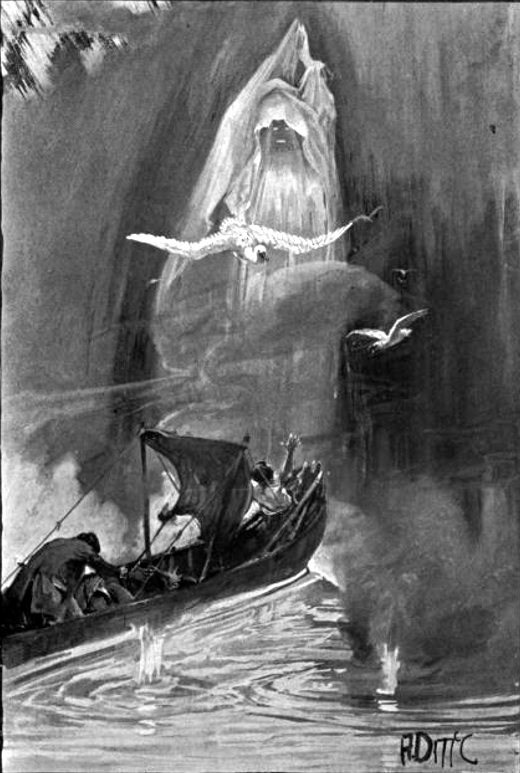 (I just finished reading The Narrative of Arthur Gordon Pym of Nantucket, which is, in its final sequences, first, a story of Lost Worlds, then, a strange and mysterious dream-vision or apocalyptic fantasy.) If conservatism is in some apprehension of the truth about human nature, then the genres of fiction that tend towards a conservative worldview--weird fiction, supernatural fiction, horror, fantasy, historical fiction, romance--will go on easily enough. And if conservatism is right about the liberalism which rages against it, then the more liberal or progressive genres--namely, science fiction--will continue to struggle. You might consider the success or un-success of various genres to be a test of this hypothesis. One alternative to a struggling science fiction is for there to be conservative version of the genre, a seeming contradiction, but not out of the question. There has been conservative science fiction before, and I imagine there is still some now, as well. Two examples from past and present are the very sub-genres about which I have written here, that is, apocalypse (or post-apocalypse) and dystopia. Both seem to be doing fine, and because the contemporary liberal or progressive in America has broken the mirror in which he might view himself, the latter--stories of dystopia--seem to be flourishing. Never mind that they tend to be descriptions of liberal rather than conservative excess, just as George Santayana implicitly predicted. The liberal or progressive reader likes them just the same and seems blissful to read them in his ignorance. A picture illustrating the very last strange and mysterious words in the main action of The Narrative of Arthur Gordon Pym of Nantucket by Edgar Allan Poe (1838). Illustration by the British artist Arthur David McCormick (1860-1943). Born January 16, 1906, Washington, D.C.
Dudley S. Corlett's collaborator on the story "The Dancer of Quena" (Oriental Stories, Spring 1932) was another adopted Angeleno, writer, archaeologist, and anthropologist Bruce Bryan. Born Leslie Bruce Bryan on January 16, 1906, he was a native of Washington, D.C. His father was Paul M. Bryan, a government worker. His mother was Ethel (Hughes) Bryan. In 1947, Bruce Bryan earned himself some notoriety by throwing his mother out of their North Hollywood home, on Mother's Day no less. I'm not sure how that all turned out, but Bruce R. Bryan, son of Bruce Bryan, also evicted that day, later died in an automobile accident. You can read about the whole mess on the blog 1947project: The original Los Angeles time travel blog, here. Bruce Bryan was first married to Charlotta R. Bryan, maiden name unknown. His second wife was (Mary) Katherine Fahrenwald, whom he wed on November 25, 1936, in Washington, D.C. Bruce R. Bryan, the son, was Charlotta's child, not Katherine's. That might have made the eviction a little easier on the boy, but hardly by much, I imagine. Despite his successes as a writer, Bruce Bryan was known as an archaeologist and anthropologist. He started in his career as the first staff archaeologist with the County Museum of Natural History, Science, and Art (now the Los Angeles Museum of Natural History) in 1926. In that capacity, he carried out investigations on San Nicolas Island, one of the Channel Islands, in October-December 1926. 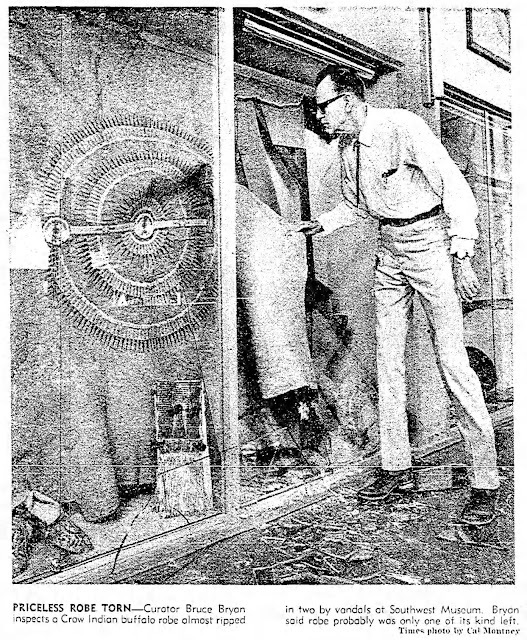 Soon after that, he went to the Southwest Museum of Los Angeles, where he eventually became archaeological curator. In the 1930 census, he listed his occupation as staff writer for a trade magazine. 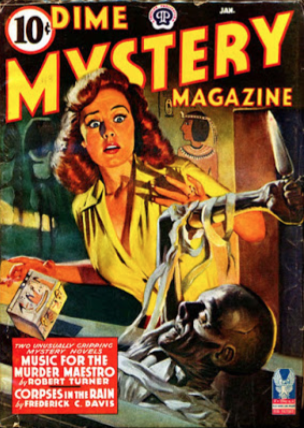 That may have been for the magazine of the museum, called The Masterkey. Bryan was also editor of that magazine at some point. Further expeditions followed his first, to Carpinteria in about 1930 and to the Dragoon Mountains of southeastern Arizona in 1932. Bryan left the museum to return to Washington, D.C., and to work in public service. He was once again with the Southwest Museum from 1959 until his retirement in 1983. He carried out further archaeological explorations of San Nicolas Island in 1958 and 1960. 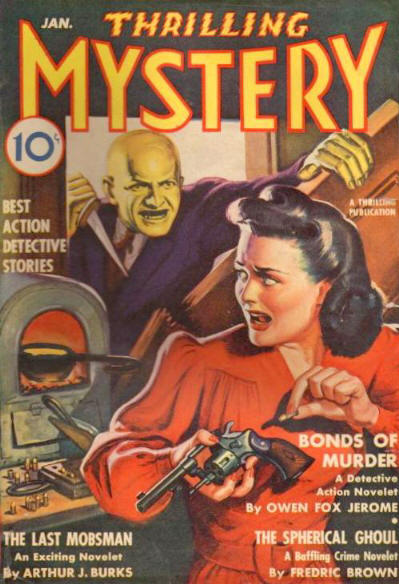 Bruce Bryan had a respectable career as a writer for popular magazines and newspapers. 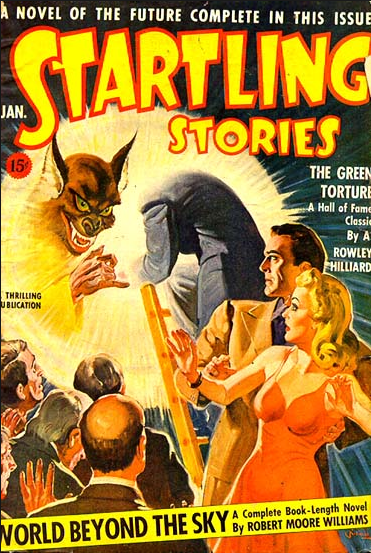 He had five stories in Oriental Stories and Weird Tales, plus a dozen letters in those two titles and in Strange Tales of Mystery and Terror and The Magic Carpet Magazine. All were printed in the period 1932 to 1939. Like his collaborator Dudley S. Corlett, Bryan wrote about movies for Art and Archaeology. His article "Movie Realism and Archaeological Fact" was published in that magazine in the October issue of 1924. I have also found a story, "Shakespeare Said It! ", in Parade of Youth for June 26, 1938, and mention of an unpublished book called The Archaeology of San Nicolas Island. In 1970, Bryan published a version of his research in the book Archaeological Explorations on San Nicolas Island. Readers of children's literature will remember San Nicolas Island as the setting for Scott O'Dell's wonderfully good novel Island of the Blue Dolphins (1960). After a very long life and career, L. Bruce Brian died on September 16, 2004, in North Hollywood, California, at age ninety-eight. "History of Archaeological Research," Natural History Museum, here. Obituary of Bruce Bryan, here. From the Los Angeles Times, October 14, 1969, part II, page 1. In the same crime, the burglars made off with poison darts. That sounds like the beginnings of a weird tale . . .
Dudley Stuart Corlett was baptized on February 15, 1880, at All Saints Church in Benhilton, Sutton, Surrey, England. Presumably, he was born shortly before that, probably in the first half of February 1880. His parents were Stuart N. Corlett and Flora Corlett. His mother's name was fitting, for Dudley S. Corlett became an expert in tropical agriculture and an officer in the operation of botanical gardens in Ceylon and the United States. 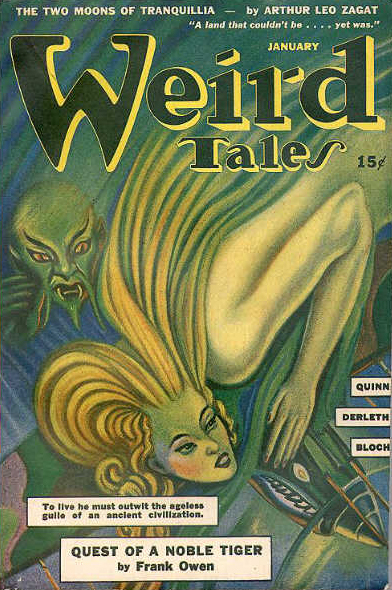 Dudley S. Corlett was also the author of a play called Amber from about 1926 and one story (with Bruce Bryan) for Oriental Stories, a short-lived companion magazine to Weird Tales. He died of heart failure on January 25, 1946, at 58 Rue el-Assa, Tangier, Morocco. Numerous articles by and about Corlett are available on the Internet. 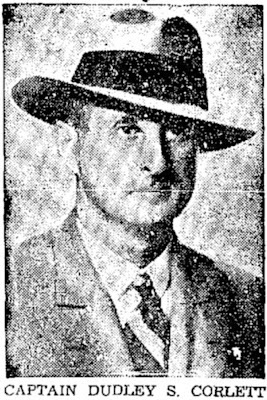 (1) Covina Argus (Calif.), Oct. 18, 1935, p. 6. 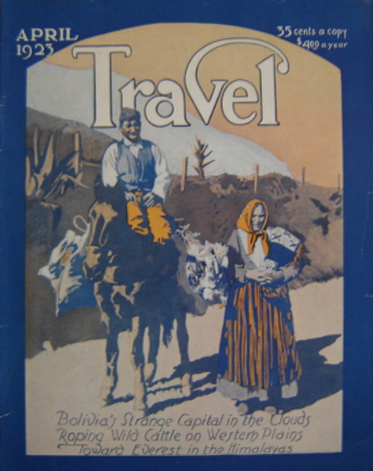 Dudley S. Corlett had an article in this issue of Travel, from April 1923 (the month after Weird Tales began). 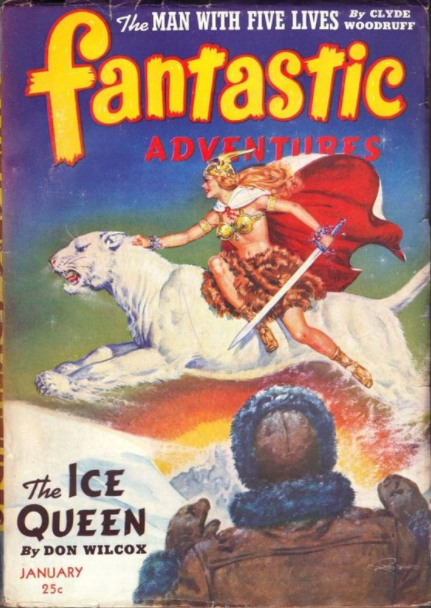 I have shown it here not only for art's sake but also to point out a similarity--namely, the two-color process--between this cover and those of Weird Tales from the same period. It was a cheap way to get color on a magazine cover without breaking your printing budget. Edna Ethel Morgan was born on December 12, 1880, the seventh daughter of Hugh Morgan, a farmer, and Sarah (Weiker) Morgan, his wife. Edna graduated high school and continued her education with two years at a college unknown to me. In 1900, calling herself by then Ethel, she lived far from home, in Dinwiddie County, Virginia, at a place called Raceland. Still in existence, Raceland is an old stagecoach tavern converted to a home for an old Virginia family. Originally called Rice's Tavern and built circa 1750 (more information at this link), Raceland was once owned by William "Racer Billy" Wynn (1784-1853), an owner and breeder of racehorses. There was a racetrack at Raceland (and slave quarters, too). Racer Billy passed the house on to his son, Marshall Ambler Moncure (1841-1900), once of the Ninth Virginia Cavalry, C.S.A. In 1900, when Ethel Morgan was living there, the head of the household was Elizabeth Imogene "Bettie" (Wynn) Moncure, widow of Marshall A. Moncure. Also in the house was Bettie's son, Ambler B. Moncure (1868-1933), and Ambler's wife, Rhoda (Morgan) Moncure (1875-1946), older sister of Ethel Morgan. Ethel Morgan taught in the public schools of Iowa for many years. In 1910, she was at Stanton, Iowa, and in 1915, at Dunkerton. In 1921, in Cedar Falls, Iowa, she married Leroy A. Dunham (1886-1977), a U.S. Army veteran of World War I (1886-1977). By 1930, the couple were in Elgin, Iowa, where Dunham was a school superintendent and his wife was a school principal. The two shared a birthday, December 12. Upon his death in 1977, Dunham was buried at Biloxi National Cemetery in Mississippi. The Dunhams moved to Alabama in the early 1930s. In 1935 and 1940, they were at Loxley in Baldwin County, Alabama. Ethel Morgan-Dunham had one poem in Weird Tales, "Magic Carpets," from July 1934. She preceded her husband in death, passing away at age seventy-nine on September 14, 1960. Ethel Dunham was buried at Colony Cemetery in Fairhope, Alabama, a place founded more than half a century before by Iowans. There is much to read on Raceland and the Wynn-Moncure families. 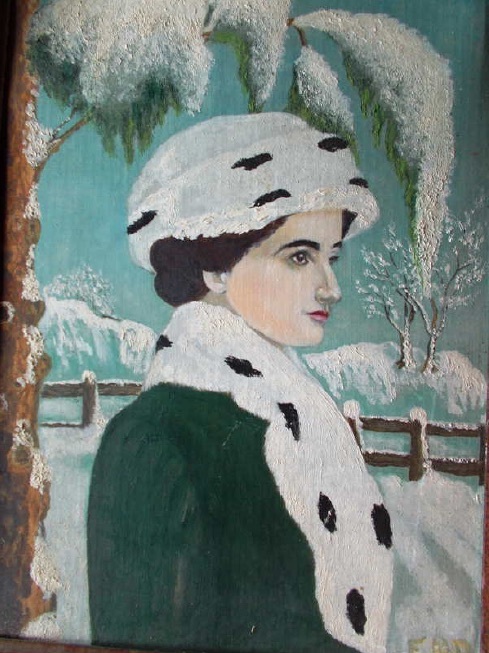 If you have access to Ancestry.com, you can read a little more on Ethel Morgan-Dunham and see a few images of her or related to her life, including the self-portrait shown below. Ethel Morgan-Dunham (1880-1960), a self-portrait. Uploaded by a user of Ancestry.com.